It’s not often NASCAR races threaten to be called by sunset, especially with many tracks having installed lights. But when an afternoon event is delayed three hours due to rainy weather, these things tend to happen. Not that Regan Smith probably minds. 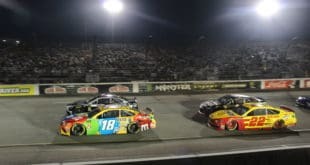 After NASCAR cut the race by ten laps Saturday, with looming darkness while a late crash by Joey Coulter dragged the event further into black skies, Smith made a daredevil move coming into the tri-oval on the final lap. As he dove to the inside, several cars wrecked behind him, but Smith pulled ahead right at the point of caution, winning the Aaron’s 312(ish). Tandem racing was in full force at Talladega Saturday, where Kasey Kahne wound up sneaking to the finish line first. But, when all was said and done it was Regan Smith who was standing in Victory Lane after a controversial ending. The finish of the race, which basically anyone saw coming because restrictor plate races these days seem unable to avoid a big last-lap accident coming to the line, was marred by uncertainty after a drag race to the checkered including Smith, Joey Logano and Smith’s JR Motorsports teammate, Kasey Kahne. All three seemed to dart across the finish at the same time, with TV broadcasters giving Kahne the edge. But as is the case with any NASCAR race, the first flag after the white flag ends the event, and the caution flag flew seconds before what would have been the race’s final ending. Though he probably would have gladly taken a top three if the caution hadn’t flown, Smith’s win might just act as slight retribution for the 2008 AMP Energy 500 at Talladega. That Cup Series race, he famously passed Tony Stewart below the yellow line, penalized for doing so despite crossing the finish first and maintaining that he was avoiding a potential accident. No matter how you slice it, and what opinion you’ve gathered on another controversial ending it was certainly a fantastic points day for Smith. Capitalizing on the lap 92 accident that involved former points leader Sam Hornish, Jr. the JR Motorsports driver darted out in front of the standings. Hornish managed 25th place, which now puts him 27 points behind for his largest deficit since the 2013 season began. Major incidents of the day, besides the last-lap fracas included Joey Coulter’s spin with just a few laps to go, as well as a multi-car crash involving Hornish, Ty Dillon, Brian Scott, Johanna Long and more. Pole sitter Travis Pastrana also encountered trouble, slamming into Reed Sorenson’s spinning car after Sorenson was turned. He finished 36th. In the final results rundown, Logano was credited with second and Kahne third. Kurt Busch and Justin Allgaier finished fourth and fifth, with Parker Kligerman, Mike Wallace, Jason White, Jeremy Clements and Austin Dillon rounding out the top 10. It’s possible more changes could come in advance of NASCAR’s “Official” results, which are usually posted the Monday after the event. It may not be enough to dispel hard feelings after losing a Talladega win in 2008, but at least Regan Smith can now say he’s a winner at the Alabama track. He did it in exciting fashion, too. 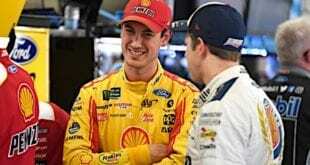 Smith came off Turn 4 on the outside, but when Joey Logano moved up the track a bit to block, he swooped down to the insidemost lane, narrowly avoiding his fellow racers in the process. Less daring drivers might have held their line behind Logano until a safer opportunity opened up, but that wouldn’t have won the race. Now, he’s a winner at Talladega and the points leader by a hefty margin. Talladega is always a great equalizer, and while the bigger teams ended up in the top 5, multiple drivers were able to score top-10 finishes that provide a nice footnote in their respective seasons. 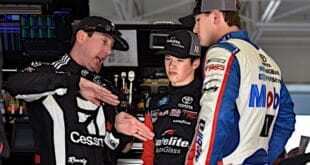 Among those: Mike Wallace, who rallied from being a lap down to run seventh; Jason White, who scored his first top 10 in the series (eighth) after first debuting in Nationwide in 1999; and Jeremy Clements, a guy who’s had good finishes in the past, but after an early season suspension definitely needed a decent showing (10th). Kyle Larson and restrictor plate racing: so far, the worst racing nightmare of his young career. There’s only three restrictor plate races in the NASCAR Nationwide Series season, something for which Kyle Larson is probably thankful. After a last-lap wreck at Daytona earlier in the season, a wreck that ended with his car’s engine wedged within the catchfence, Larson’s plate racing record took another hit Saturday with two separate incidents. 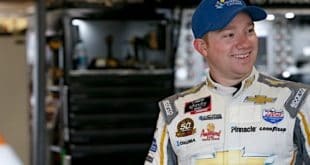 The first came after contact with Danica Patrick that sent his Turner Scott Motorsports teammate spinning, though the rookie escaped without any damage. The next time, he wasn’t so lucky, with a blown tire ruining his evening, relegating him to 38th place and dropping him out of the top 10 in points. While quite a few underdogs scored great finishes, many were also caught up in unfortunate accidents that have to be disheartening; when the possibilities are more, the disappointment of a poor result tends to be all the more disenchanting. Shout outs to Mike Harmon, Tim Andrews, Bobby Gerhart, Blake Koch, Johanna Long and more, who were caught up in accidents during the race, sometimes not even of their doing, despite running well beforehand. Another plate race, another last-lap crash. While the finish did provide excitement, mainly through the heroics of Smith, another race ending in carnage always recalls the crashes that came before it, and it’s gotten to the point where one sort of expects a big wreck coming to the finish line. Luckily, major injuries both on-track and off it were avoided, but one has to wonder how much longer such a thing can be deterred before something really bad happens, because it’s obvious these accidents aren’t going away. The first of three races in Joe Gibbs Racing’s No. 54 started off well for Joey Coulter, and actually remained fairly solid until the end of the race, when he was turned into the outside wall and finished a disappointing 21st. Let’s be real: with the kind of horsepower those cars have, a Coulter win wouldn’t have been too far-fetched. Maybe next time! Underdog Performer of the Race: I’m not only saying this because he was the highest finishing underdog, but Mike Wallace went a lap down early after losing the draft, was still able to rally to seventh and was really moving in the closing laps due to a push from Elliott Sadler. Wallace is known to be a great plate racer, but that’s still impressive. It was actually a solid day all around for Johnny Davis Motorsports, even though Landon Cassill ended up caught in the final accident. Start-and-parkers occupied one of the 40 starting positions in Saturday’s race, taking home $14,425 in purse money. Cup regulars scored three of the top 10 finishing positions, occupied six of the 40 starting positions, and took home $158,945 in purse money. NASCAR did what it needed to do to get the race in at all, which is commendable. Beginning the race around 6 PM EST could have been a recipe for disaster without any lights at the track, and while 10 laps had to be cut in order to keep the race from descending into total darkness, it was still an incredibly exciting race, one of the best of the season. The call at the end of the race to throw the caution was hence a good move, because given the increased darkness, avoiding the wreck in the tri-oval was going to be much tougher for the cars that were a little farther behind. Don’t want someone running with reckless abandon into stopped vehicles… potential recipe for tragedy. Nonetheless, it was great to see Regan Smith finally get that plate racing retribution at Talladega, as well as to see a new leader in the points. A few weeks ago, we might have expected Sam Hornish, Jr. to run away with the championship, despite it being very early in the season. Now? Who knows.